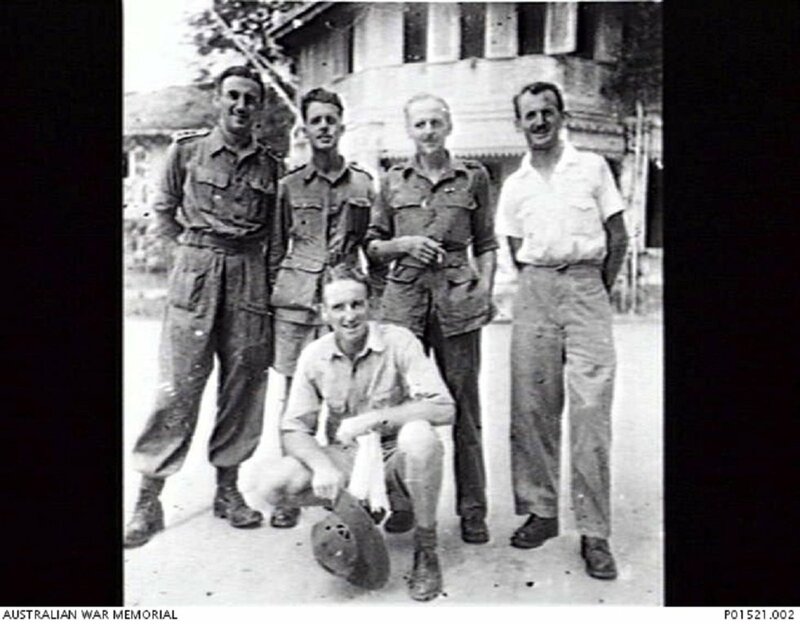 Former POWs (from left to right) Captain C. Howitt, Lieutenant R. Nixon, Captain B. Edwards, Captain J. Hill and Sergeant Cook visit the Chinese Chamber of Commerce building in Bangkok, while waiting for evacuation to Australia, September 1945. Image courtesy of C. Mitchell (Donor), Australian War Memorial. 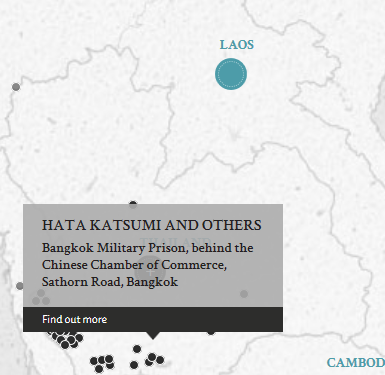 Warrant Officers Hata Kasumi and Tominaga Kisaburo and Sergeants Harada Genpu, Tanaka Yasuhiro, Fukuyoshi Tatsuo, Mizobuchi Kintaro, and Morta Masahiro were gaolers and warders on the staff of the Japanese Military Prison at Bangkok, Siam, under a certain Captain Koyama. Between February and August 1945 they had British, American, Dutch, and Chinese prisoners in their custody. It was alleged that they consistently ill-treated their prisoners, the ill-treatment consisting of poor living conditions as well as specific acts of brutality. The most damning evidence related to specific instances of ill-treatment and in particular to a series of severe beatings and tortures meted out to a Chinese suspect (known as No. 105) in the period leading up to his execution. However, it appears that the general conditions were possibly less harsh than under what was usually expected. The defence was a complete denial of any ill-treatment or torture. It was averred that Koyama had issued orders to treat prisoners humanely. These instructions were passed on by Hata and Tominaga and obeyed by the others. However, it was admitted that Hata, Tominaga, Tanaka, and Fukuyoshi had on occassion disregarded these orders in so far as they felt it was in the interests of the prisoners to "pat" or "lightly beat" them for petty misdemeanours rather than to report and bring upon them more serious punishment. They strenuously denied that such action could in any way be considered ill-treatment or torture. This case should be read in conjunction with Ueda Sueyoshi and others. Many of the victims were ill-treated by the Japanese military personnel in both these cases. This was because the victims were first interned at Kanburi Kempeitai HQ but subsequently transferred to the Japanese Military Prison in Bangkok, Siam. Consequently, the Prosecution relied upon the same set of affidavits in both cases. Hata, Kasumi. Warrant Officer. From Japanese military. From Japan. Guilty. 4 years' imprisonment. Sentence confirmed. Tominaga, Kisaburo. Warrant Officer. From Japanese military. From Japan. Guilty. 2 years' imprisonment. Sentence confirmed. Harada, Genpu. Sergeant. From Japanese military. From Japan. Guilty. 2 years' imprisonment. Sentence confirmed. Tanaka, Yasuhiro [Yashuhiro]. Sergeant. From Japanese military. From Japan. Guilty. 4 years' imprisonment. Sentence confirmed. Fukuyoshi, Tatsuo. Sergeant. From Japanese military. From Japan. Guilty. 1 year's imprisonment. Sentence confirmed. Mizobuchi, Kintaro. Sergeant. From Japanese military. From Japan. Guilty. 6 months' imprisonment. Sentence confirmed. Morita, Masahiro. Sergeant. From Japanese military. From Japan. Guilty. 9 months' imprisonment. Sentence confirmed. Massie, L.A. Lieutenant Colonel. From British military. Solicitor. Court President. Blaauboer, M.A. Captain. From Dutch military. Bains, N.S. Major. From British Indian Army. LL.B., Pleader, Lahore High Court. Sugimatu, Fujio. Civilian. B.L. Barrister. Supreme Court Tokyo. R.V. Borovsky. Captain. From British Indian Army.